Revealed on Warseer but I don't know when it's available or from which shop. Frankly, at the rate tjub kept, half of everything would soon have reminded us of one of his fireborn concepts hadn't he came up with the obsidian golems. I like the balloon a lot! Haha, jump there should be a few of you out there! Who wants to acquire the "target" - can do it on the page on Facebook. Nice going Wood Axe! I hope the balloon find a home with many collectors. I've got some proposals for you to get better spread with your releases. As we say about business in Sweden, "If you're not visible, you don't exist", and I sure hope interested collectors will find their way to your great sculpts! First of all, always contact Wargames News & Terrain whenever you release a new product. They want people to write the announcement article themselves, but don't hesitate to ask for help (e.g. here on CDO; we're always willing to help) if you want help with the announcement write-up in English. 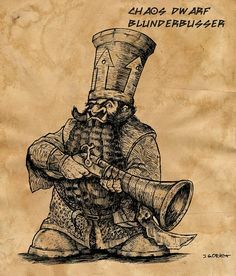 Second, you'll want to register and announce the release of the Sky Watcher Dwarf Balloon (and all future releases relevant to Dwarfs) here on Bugman's Brewery as well as on CDO. Warhammer Empire for the Witch Hunter. The more relevant sites, the merrier. Third, you'll want to include a picture of the miniature in the release announcement post. Images speak loudly, and helps draw people in. Fourth, you'll want to register as a supporting company on the Ninth Age, since many fantasy wargamers frequent that site. Make an account, contact Calisson, and after reading all the legalese and so on, you'll get access to the Company Showcase forum, where you can start your own Wood Axe thread, and share all sculpting updates and releases there. Fifth, and this is something of a hassle, but worth doing for a small company once you get the hang of it. On the Ninth Age (T9A) site there are subforums for the various factions. You can't access them until you've registered an account. In this case, seek out the Dwarven Holds subforum, and ALSO announce your release in this thread. It's where all new faction releases from all companies are discussed and shared. And here comes the hassle: Seek out the army's miniature Wiki page, search out the relevant category (Steam Copters, in this instance) and try to add your new release as well as possible as you can conform to the standards in the wiki page (try to mimic how everything else is built-up). People use the miniature wiki for shopping, and you want collectors to stumble across your work there for years to come. Sixth, also announce your new releases on DakkaDakka and Warseer. If you have anything you wonder about, then don't hesitate to ask. I'm just sharing tips for how to get some better outreach to relevant hobbyists (Facebook not taken up here). Credit where credit is due it is a lovely miniature. But I reckon my helihats would have it!